Creepy Baby is red carpet ready! For tonight’s Academy Awards she is wearing a custom ski mask from my couture collection. 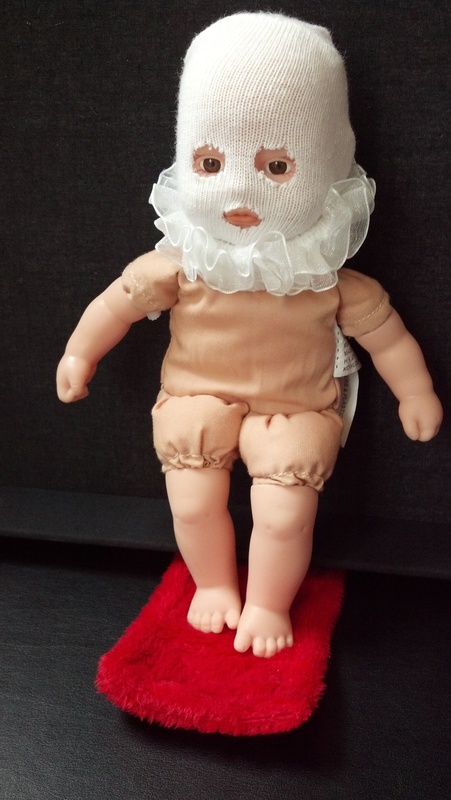 Creepy Baby’s friend, Hannibal, has joined her to watch the annual salute to cinematic achievement. Creepy Baby first met Hanny after she saw him in Silence of the Lambs, which she was extremely disappointed to discover is NOT a children’s film. THERE AREN’T EVEN ANY LAMBS IN IT. Once she recovered from a mild case of PTSD, she and Hanny became fast friends thanks to their mutual love of scaring the living shite out of people. Please note that Hanny’s fava beans have been carefully diced to avoid a choking hazard. Because he is a baby, after all. And also that’s the only way to get the food through those metal bars. Creepy Baby would like to thank Molly Field, whose apparent love of Jame Gumb, arguably one of the creepiest villains of all time, inspired today’s post. Creepy Baby would like to point out that she is not wearing one of Mr. Gumb’s skin suits, despite the striking similarity. She would also like to thank my husband for taking time out of his Saturday night to help stage Hannibal’s photo shoot. Trust me dear, I am just as confused and worried about my latest hobby as you are. 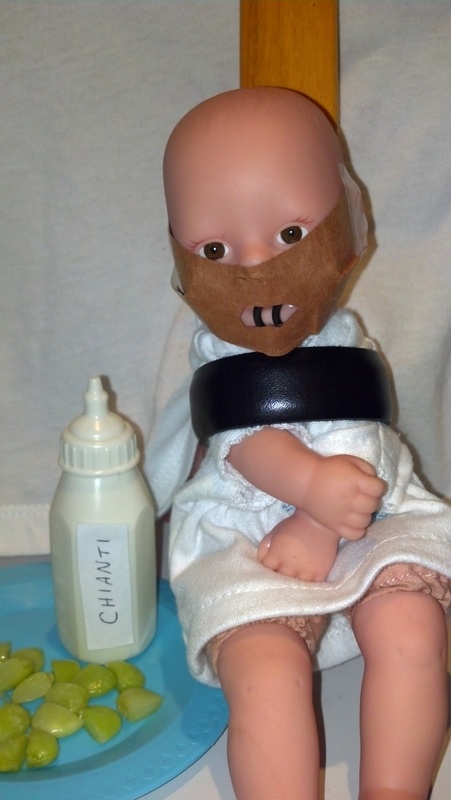 This entry was posted in Uncategorized and tagged Creepy Baby, Hannibal Lecter, Oscars by BananaWheels. Bookmark the permalink. The fava beans are a nice touch, as is the bracelet restraint. Why thank you. I clearly have too much time on my hands. I cannot stop laughing! This is so disturbing in all of the best ways possible. I may have to creat a new board on Pinterest just for your creepy baby stuff. I LOVE THIS. I LOVE YOU. THIS SO WRONG IT’S RIGHT. Thank you so much for absolutely making my day! I’m so glad you like it. I aim to please. And I admit I enjoyed making little Hanny. I have a newfound sympathy for that sweet cannibal.